It's not very often you can secure a half-sister to two gun early running machines like trainer Danny O'Brien did at Inglis' Melbourne Premier sale this week without breaking the bank. O'Brien was thrilled with his purchase as he rated the filly the "Pick of the Sale". "She is half sister to multiple black-type juvenile winners Eloping and Of The Brave, and she looks to be worth every penny as her broodmare value can only be advanced by her own racing career," O'Brien said of the $220,000 purchase. Eloping won six races and more than $1 million in stakes during her career, while the ill-fated Of The Brave was winner of two of his three career starts before cruelly being denied his chance to back up his two-year-old performances as a three-year-old. "She has early running form on both sides her pedigree as her sire Sepoy was the Champion Two and Three-year-old of his generation," O'Brien said. 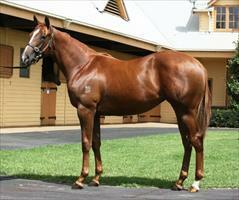 Sepoy won the Blue Diamond, Golden Slipper, Coolmore Stud Stakes and Manikato Stakes all at Group 1 level.